Eucalyptus has been used for centuries as an herbal medicine for respiratory ailments and as an essential oil. Cough syrups and lozenges use eucalyptus for its healing qualities. Cooking with eucalyptus is a delicate art as it can be harmful if ingested before it's cooked. Specialty dishes using eucalyptus have been developed by everyone from experienced chefs to local fishermen, all using the leaf to enhance the flavor of food. 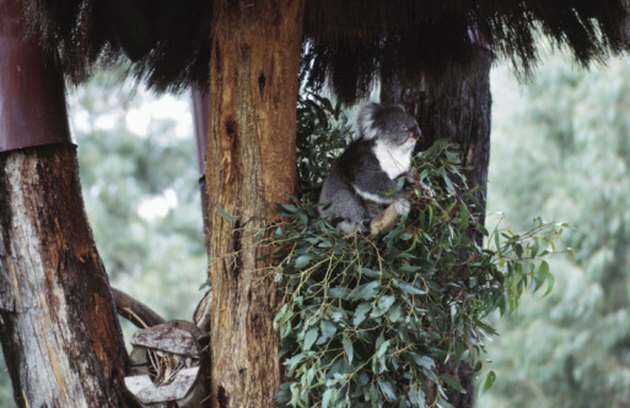 Koalas and humans savor the eucalyptus leaf in food preparation. In Portugal, it is common practice for fishermen to cook their catch over a charcoal fire after placing a bunch of juniper leaves inside the cleaned cavity of the fish. Near the end of the short cooking time, a eucalyptus leaf dipped in sea water and put over the coals imparts a rich smoky flavor to the fresh catch. Try this at home when grilling fish, meat or vegetables for that unique eucalyptus smoky flavor. A paper produced by the University of Maryland recommended preparing tea made from eucalyptus leaves to help heal sore throats and congestion. Use up to ½ teaspoon per cup of tea and let it steep for 10 minutes prior to pouring. Use a strainer to separate the leaves from the liquid. Spanish chef Michael Bras uses the eucalyptus leaf to create an infusion that he uses in a springtime celebration of fruit and vegetables. Executive Chef Jason Fox of the Commonwealth Restaurant in San Francisco uses eucalyptus leaves steamed in warm cream for his eucalyptus potato puree. Eucalyptus infused butter is another exotic addition to potatoes. Eucalyptus, when combined with summer fruit, makes an effective herbal jelly. Use it when a cold or respiratory ailment comes on and it helps diminish the cold symptoms. The jelly can be stored for up to a year when it's in a sealed jar and put in a cool, darkened place. After it is opened, store in the refrigerator.